Credit: Calista Harbaugh, M.D; American Academy of Pediatrics National Conference and Exhibition; University of Michigan C.S. Mott Children's Hospital. CHICAGO – Research being presented at the American Academy of Pediatrics 2017 National Conference and Exhibition shows that post-surgical opioid pain medications prescribed after common surgeries may become a pathway to continued, nonmedical opioid use by teens and young adults. The study abstract, "Persistent Opioid Usage among Pediatric Patients Following Surgery in the United States," will be presented on Sunday, Sept. 17, at the Marriott Marquis Chicago. Researchers examined data including nearly 90,000 privately insured U.S. patients between ages 13 and 21 (averaging age 17) with no previous opioid prescriptions who underwent one of 13 common surgeries for this age group, compared with a control sample. They looked for persistent opioid use, defined as continued prescription refills 90 to 180 days after the surgical procedure and beyond what is expected after routine surgery. They found the incidence of new persistent opioid use following surgery was 4.8 percent, ranging from 2.7 percent to 15.2 percent across procedures, as compared to 0.1 percent in the nonoperative control group. Gallbladder removal and colon surgery were among procedures associated with highest risk of new persistent opioid use, said lead abstract author Calista Harbaugh, M.D., a general surgery resident at the University of Michigan Medical School and pediatric surgery researcher at C.S. Mott Children's Hospital and the Michigan Opioid Engagement Network. In addition, they found older youth with additional chronic conditions, depression, anxiety or prior substance use disorders were at higher risk. "Opioids are commonly prescribed for pain after surgery, and until recently it was generally believed they were not addictive," Harbaugh said. Recent research has shown that many adults are chronically using opioids after surgery, she said, but this is the first to show that long-term opioid use may also be a significant problem for adolescents and young adults who have surgery. "The study is an important step toward recognizing that the opioid epidemic is affecting adolescents and young adults in a major way," Harbaugh said, noting that when a refill is provided, the opioid pills may have been used, or they may have been saved or given to someone else in the community. "Most adolescents who misuse prescription opioids get the pills from leftover prescriptions of their family, friends, or their own," she said. "We need to make sure that we treat pain after surgery, but it must be balanced with the risk of providing more opioid than necessary to patients and their communities." Harbaugh will present the abstract, funded by the Michigan Department of Health & Human Services and available below, on Sunday, Sept. 17 from 11:57 a.m. to 12:02 p.m. in the Marriot Marquis Chicago in Grand Horizon D-G.
Purpose: In recent years, opioid prescribing in the United States has soared, and has been followed by rising rates of nonmedical prescription opioid and heroin abuse. Recent studies demonstrate that postoperative care is an important risk factor for new opioid dependence. The purpose of this study is to investigate incidence of new persistent opioid use after surgery among opioid-naïve adolescents. Methods: We performed a retrospective cohort study including privately insured opioid-naive adolescents (13-21 years), who underwent one of thirteen common surgeries (Truven Marketscan, January 1, 2010-June 30, 2015). As a comparison, we included a random sample of 3% of patients aged 13 to 21 years without procedural codes or opioid prescriptions across a similar time period prior to a randomly assigned fictitious surgery date. The primary outcome was new persistent opioid use, defined as continued opioid prescription fills captured by pharmacy claims between 90 and 180 days after the index surgical procedure. Results: The surgical cohort included 88,637 patients (mean age: 17.1±2.4 years). 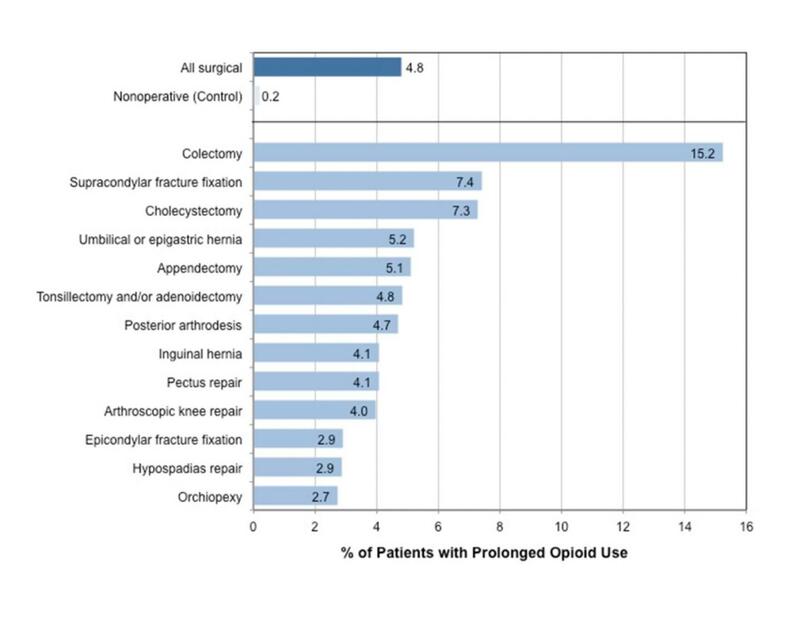 The incidence of new persistent opioid use following surgery was 4.8%, ranging from 2.7% to 15.2% across procedures, as compared to 0.1% in the nonoperative control group. Procedures associated with higher risk of new persistent opioid use were cholecystectomy (adjusted odds ratio [aOR], 1.191; 95% CI, 1.062-1.335) and colectomy (aOR, 2.753; 95% CI, 1.222-6.203). Risk factors independently associated with new persistent opioid use included older age (aOR, 1.068; 95% CI, 1.054-1.082), female gender (aOR, 1.241; 95% CI, 1.160-1.329), higher comorbidity score (aOR, 1.015; 95% CI, 1.007-1.022), anxiety (aOR, 1.179; 95% CI, 1.004-1.384), and substance and drug use (aOR, 1.460; 95% CI, 1.163-1.833). Conclusion: New persistent opioid use after surgery is common and may represent a significant pathway to nonmedical opioid use among adolescents. Identifying safe, evidence-based practices for perioperative pain management among adolescents is a top priority.